Now we're starting to get a bit closer to the final version. 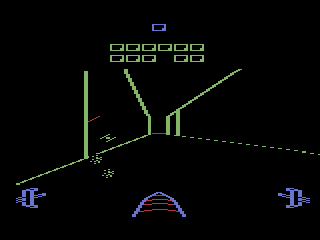 The Tie Fighter has been implemented and shoots fireballs out at you, but the collision detection still isn't done so you can't shoot anything. The difficulty switch still switches screens, but the tie fighter will actually appear on the trench screen flying in and out of the walls! This prototype still has a long way to go before being a finished product. The left difficulty switch changes between the space screen and the trench screen. 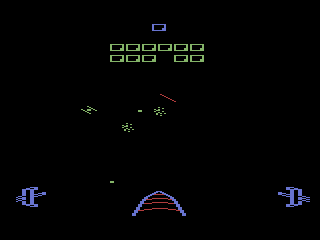 Only one Tie Fighter appears in this version, and it will endlessly circle around shooting fireballs at you. The Tie Fighter will stay on the screen even if you switch to the trench screen. The fireballs only have one size and do not appear to come out of the background. The fireballs cannot be shot or avoided. The fireballs are green instead of red or blue. If your shields drop to zero the next hit will reset them to eight. You can shoot, but you can't actually hit anything since there is no collision detection. Up and down actually move the crosshairs up and down. This is the reverse of the final version which corresponds to real flight controls (up is down and down is up). The stars fall straight down from top to bottom instead of coming from the middle and going to the left and right. The counters for tower points and number of towers left is always displayed on the screen even thought he tower screen is not present in this version. The crosshairs movement has been slowed down a bit. The tower screen is missing. The walls of the trench are green instead of blue. There are no barriers in the trench. Neither the space screen or trench screen have an end. The score counter doesn't work. There are no sounds or music. Why is the Tie Fighter in the trench?